Puerto Vallarta is a vacationer’s delight with so much to see and do—including enjoying amazing culinary artistry at some favorite Puerto Vallarta restaurants. What’s not to love about Puerto Vallarta? Gorgeous beaches with soft sand and cool blue waters, rich history and culture dating back thousands of years, inspiring color and artistry everywhere you turn, and of course some of the most amazing food on the planet. And since we all know that there’s nothing better than getting a good restaurant recommendation, check out some of these favorite Puerto Vallarta restaurants suggested by recent visitors that you absolutely must try. When you think of Mexico, you probably think of tacos, and Pancho’s Takos have some of the best you will find. They are famous for their al pastor, but all of their varieties are outstanding. 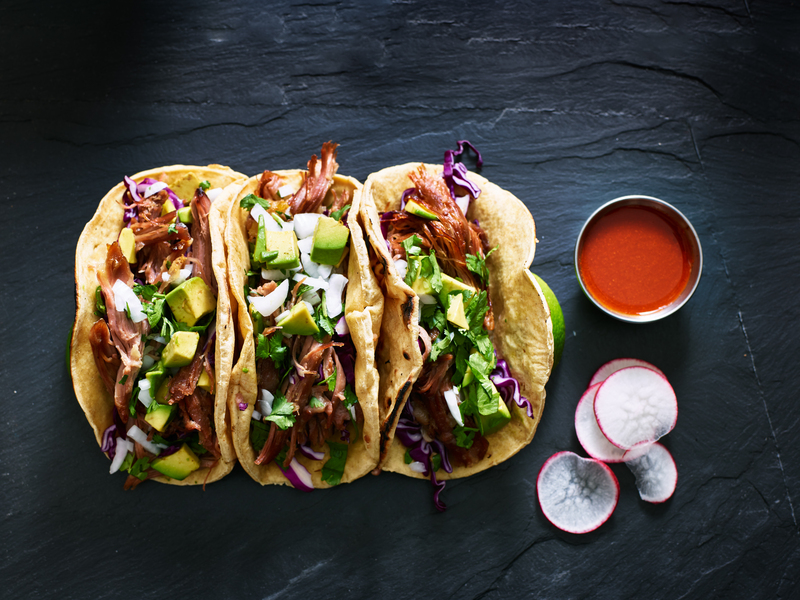 They use fresh ingredients to capture the exquisite flavor of Mexico. You should also try the aguacate rellenos, avocados stuffed with meat, seafood, or vegetables. They have many homemade sauces you can try, from mild picante to a super spicy pineapple habanero. Wash it down with an ice cold beer and you will be in taco heaven. This is a fun, popular, and inexpensive Puerto Vallarta restaurant, so come early or expect to wait in line. Don’t worry though, Pancho’s Takos are worth the wait! From simple fare to elegant fine dining, Puerto Vallarta restaurants have it all, and Le Kliff is one of the most elegant and romantic restaurants you will find. It is a short drive up into the mountains, but the stunning view alone is worth the trip—and the food is beyond compare. Their menu embraces traditional Mexican cuisine with a modern twist, and uses fresh locally-caught fish and seafood whenever possible. Many reviewers describe it as the best dining experience of their life. Le Kliff is a seafood lover’s dream. If you are up for some adventurous eating, try the Tropical Guacamole: Grasshoppers, mango, jicama, and marinated panela (solid unrefined cane sugar). Sometimes you have to get off the beaten path to find the best treasures. The malecon, or pier, in Puerto Vallarta is a popular place for sightseeing and shopping, but just a couple blocks off of the pier is La Ronda. It is a small, quaint family restaurant with amazing food and an eccentric staff. When you walk into La Ronda, you will almost feel like you are walking into their home—and they will treat you that way. As with so many Puerto Vallarta restaurants, they use fresh local ingredients to create delectable dishes. You can eat light with tortilla soup, ceviche, or their extraordinary guacamole. La Ronda is also a fun place to watch sporting events, particularly American football and soccer, and feast on some alitas (chicken wings). Be sure to check out their especial de cervezas on Thursdays, Fridays, and Saturdays too. If you find that you have gone a little heavy on the chorizo and cheese, breakfast or lunch at Salud Super Food can help you get back on the healthy track. This Puerto Vallarta restaurant in the Zona Romantica specializes in healthy alternatives like salads, wraps, and super bowls filled with superfoods. Salud Super Food has a number of vegan, vegetarian, and gluten-free options on the menu. Other menu items can be altered to meet these dietary requests when possible. Salud Super Food is awesome for a quick nutritious breakfast before you head out on your PV adventures for the day. If you like shrimp, going to Jorge’s is a must! You will be greeted by Jorge and his family and served with smiles and excitement. The recently remodeled restaurant is colorful and artsy, and the lighting is vibrant—but not overly bright—so the ambiance has a delightfully mellow quality to it. Try the coconut shrimp—it is one of their most popular dishes. Combine that with their tropical fruit salad and one of their lovely cocktails for an incredible meal and you’ll fly back just to hit this amazing Puerto Vallarta restaurant again. Traveling with a group and can’t come to a consensus on where to eat? Head to the Food Park of Puerto Vallarta. Made up of food trucks and containers, you can please just about every appetite in one location. The different restaurants have sushi, hamburgers, pizza, tacos, chicken wings, ceviche, ribs, salads, waffles, ice cream, and so much more. You can get drinks, both alcoholic and non-alcoholic, and finish the meal with a coffee. If you have a car, they have a large lot with plenty of parking. What’s better than a Puerto Vallarta restaurant? One locale with a LOT of Puerto Vallarta restaurants! If you are a traveler foodie, a great option for your trip to Puerto Vallarta is to book tours to nearby towns, that are the best-kept secrets around, where you not only will discover the history of Mexico through its pebble stone streets, charming churches and artisan shops, but also enjoy true farm-to-table gastronomic experiences, highlighting the best of local organic ingredients, produce and spirits. Unveiling Mexico’s culture through its flavors is one of the best ways to immerse yourself in its rich (and delicious!) heritage.